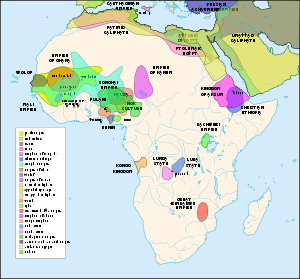 Map showing Africa’s pre-colonial empires, including the Empire of Ghana. The Ghana Empire or Wagadou Empire (existed c. 750-1076) was located in what is now southeastern Mauritania, Western Mali, and Eastern Senegal. This is believed to be first of at least three great empires that would rise in that part of Africa from the ninth to the sixteenth centuries (it was followed by the Mali Empire and the Songhai Empire). It first began in the eighth century, when a dramatic shift in the economy of the Sahel area south of the Sahara allowed more centralized states to form. It is known as an Iron Age empire. The introduction of the camel, which preceded Muslims and Islam by several centuries, brought about a gradual revolution in trade, and for the first time, the extensive gold, ivory, and salt resources of the region could be sent north and east to population centers in North Africa, the Middle East and Europe in exchange for manufactured goods. The Empire grew rich from the trans-Saharan trade in gold and salt. This trade produced an increasing surplus, allowing for larger urban centers. It also encouraged territorial expansion to gain control over the lucrative trade routes. Most of the early written information is about the Almoravids, who invaded the kingdom in the late ninth century. The first written mention of the kingdom comes soon after it was contacted by Sanhaja traders in the eighth century. In the late ninth and early tenth centuries, there are more detailed accounts of a centralized monarchy that dominated the states in the region. The Moorish scholar al-Bakri (1014-1094) collected stories from a number of travelers to the region, and gave a detailed description of the kingdom in 1067. At that time it was alleged by contemporary writers that the Ghana could field an army of some 200,000 soldiers and cavalry. This was a formidable regional military and trading power that endured for over three hundred years. Rebecca Green points out that, “the people of the empire of Ghana are said to have enjoyed a world rich in culture and famous as a center of learning and trade during the Middle Ages, while most of the people of Europe suffered fear, ignorance and oppression.” It is more usual to see negative comparisons of Africa with Europe than vice verse, since much history reflects a Euro-centric bias. Knowledge of this empire, built up through commerce more so than conquest, can help to construct a more balanced story of where, when and how human societies have flourished. The empire was known to its own citizens, a Mande subgroup known as the Soninke, as Wagadou. 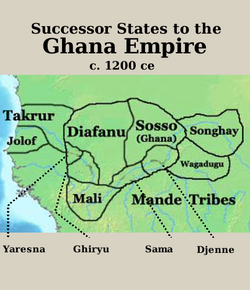 The dou in the empire's name is a Mandé term for "land" and is prevalent in place names throughout central West Africa. The waga in the name roughly translates to "herd." Thus, Wagadou translates to "Land of Herds." The Empire became known in Europe and Arabia as the Ghana Empire by the title of its emperor. The Ghana Empire is believed by many to have been a continuation of the cultural complex at Tichitt-walata attributed to Mandé people known as the Soninke. Subsequent incursions of Amazigh Berber tribes, however, collapsed the earlier socio-political organization in the region and established small settlements in the area known as Awkar, around the middle of the fourth century. Around 750 or 800 C.E. however, the Soninke adjusted and united under Majan Dyabe Cisse or Dinga Cisse in taking over Awkar. Some people believed that the Ghana Empire was a small kingdom, with its base at the city of Kumbi, and that Al Fazari was the first to describe it to the world. Later, it was conquered by King Sumaguru Kante of Sosso in 1203. It was later incorporated by the King of Mali around 1240. Some archaeologists think that the Mandé are among the first people on the continent, outside the Nile region and Ethiopia, to produce stone settlement civilizations. These were built on the rocky promontories of the Tichitt-Walata and Tagant cliffs of Mauritania where hundreds of stone masonry settlements, with clear street layouts, have been found. Dating from as early as 1600 B.C.E., these towns had a unique four-tier hierarchy and tribute collection system. This civilization began to decline around 300 B.C.E. with the intrusion of Berber armies from the Sahara, but with later reorganization and new trade opportunities, the Wagadou/Ghana Kingdom arose. This polity seems to have inherited the social and economic organization of the Tichitt-Walata complex. Over time, Wagadou became the center of power for trade in the region. The Dinga Cisse became the first Ghana (warrior king) and his clan became the rulers of the new state. To this day, the Cisse name is prominent in the politics of Mali and Mauritania. The empire's capital was built at Koumbi Saleh on the edge of the Sahara. The capital was actually two cities six miles apart separated by a six-mile road. But settlements between the cities became so dense due to the influx of people coming to trade, that it merged into one. Most of the houses were built of wood and clay, but wealthy and important residents lived in homes of wood and stone. This large metropolis of over 30,000 people remained divided after its merger forming two distinct areas within the city. The name of the other section of the city has not been passed down. We do know it was the center of trade and functioned as a sort of business district of the capital. It was inhabited almost entirely by Arab and Berber merchants. Because the majority of these merchants were Muslim, this part of the city contained more than a dozen mosques. The empire owed much of its prosperity to trans-Saharan trade and a strategic location near the gold and salt mines. Both gold and salt seemed to be the dominant sources of revenue, exchanged for various products such as textiles, ornaments and cloth, among other materials. Many of the hand-crafted leather goods found in old Morocco also had their origins in the empire. The main center of trade was Koumbi Saleh. The taxation system imposed by the king (or 'Ghana') required that both importers and exporters pay a percentage fee, not in currency, but in the product itself. Tax was also extended to the goldmines. In addition to the exerted influence of the king onto local regions, tribute was also received from various tributary states and chiefdoms to the empire's peripheral. The introduction of the camel played a key role in Soninke success as well, allowing products and goods to be transported much more efficiently across the Sahara. These contributing factors all helped the empire remain powerful for some time, providing a rich and stable economy that was to last over several centuries. The court of appeal is held in a domed pavilion around which stand 10 horses covered with gold-embroidered materials. Behind the king stand 10 door of the pavilion are dogs of excellent pedigree that hardly ever leave the place where the king is, guarding him. Round their necks, the dogs wear collars of gold and silver studded with a number of bells of the same metal. When a Ghana died, he was succeeded by his sister's son. The deceased Ghana would be buried in a large dome-roofed tomb. The religion of the kingdom involved emperor worship of the Ghana and worship of the Bida'a, a mythical water serpent of the Niger River. The empire began struggling after reaching its apex in the early eleventh century. By 1059, the population density around the empire's leading cities was seriously overtaxing the region. The Sahara desert was expanding southward, threatening food supplies. While imported food was sufficient to support the population when income from trade was high, when trade faltered, this system also broke down. The growing power of the Almoravids soon led them to launch a war against Ghana in 1062 under Abu-Bakr Ibn-Umar to gain control of the coveted Saharan trade routes. The war was justified as an act of conversion through military arms (lesser jihad). The Almoravids fought the Ghana Empire for five years before reaching and laying siege to the capital city in 1067. For ten more years, under the leadership of Ghana Bassi and his successor Ghana Tunka Manin, the empire resisted. Finally, in 1076, General Abu-Bakr Ibn-Umar captured the capital and ended the state as an empire while converting many to Islam. General Abu-Bakr died in 1087 and the Almoravid rule over the remains of the Ghana Empire did not long survive him. The now fractionalized region came under the rule of the Soninke again, though with far less power. Around 1140, the rabidly anti-Muslim Sosso people of the Kaniaga kingdom captured much of the former empire. Diara Kante took control of Koumbi Saleh in 1180 and established the Diarisso Dynasty. His son, Soumaoro Kante, succeeded him in 1203 and forced the people to pay him tribute. The Sosso also managed to annex the neighboring Mandinka state of Kangaba to the south, where the important goldfield of Bure were located. In 1230, Kangaba led a rebellion under Prince Sundiata Keita against Sosso rule. Ghana Soumaba Cisse, at the time a vassal of the Sosso, rebelled with Kangaba and a loose federation of Mande speaking states. After Soumaoro's defeat at the Battle of Kirina in 1235, the new rulers of Koumbi Saleh became permanent allies of the Mali Empire. As Mali became more powerful, Koumbi Saleh's role as an ally declined to that of a submissive state. It ceased to be an independent kingdom by 1240. The modern country of Ghana is named after the ancient empire, though there is no territory shared between the two states. There are traditional stories that the survivors of the Ghana Empire migrated to the region of modern Ghana, and there is sufficient evidence to prove this. Some inhabitants of present Ghana had ancestors linked with the medieval Ghana. This can be traced down to the Mande and Voltaic people of Northern Ghana—Mamprussi, Dagomba and the Gonja. Anecdotal evidence connected the Ashanti/Akans to this great Empire. Certainly they, too, were legendary for their gold ornamentation and wealth. The evidence lies in names like Danso shared by the Akans of present Ghana and Mandikas of Senegal/Gambia who have strong links with the Empire. If the Ashanti did originate from the area of the Ghana empire, then there is a link between ancient Ghana and the modern nation-state of Ghana, since in 1902 when the British Empire dissolved the Ashante Empire, they incorporated it within their colony of Gold Coast (now Ghana), where the titular and largely ceremonial office of the high king of the Ashanti continues. King Kaya Maja: circa 350 C.E. 21 Kings, names unknown: circa 350 C.E.-622 C.E. 21 Kings, names unknown: circa 622 C.E.-750 C.E. ↑ Green 1998, pp. 48-9. ↑ Patrick J. Munson, 1980, “Archaeology and the Prehistoric Origins of the Ghana Empire,” The Journal of African History 21:4:457-466. ↑ Ancient Ghana The Story of Africa: West Africa Kingdoms, BBC. Retrieved May 20, 2008. ↑ al-Bakri, 2004, Al-Bakri’s online Guide to the Ghana Empire: the king World Books. Retrieved May 20, 2008. Kea, Ray A. 2005. ”Expansions And Contractions: World-Historical Change And The Western Sudan World-System 1200/1000 B.C.E.–1200/1250 C.E.” Peace Research Abstracts, Sage Publications. 42:3. ISSN 0031-3599. Mauny, R. 1971. “The Western Sudan,” pp. 66-87, in P.L. Shinnie, The African Iron Age. Oxford, UK: Clarendon Press. ISBN 9780198131588. Monteil, Charles. 1953. “La Légende du Ouagadou et l’Origine des Soninke,” pp. 359-408 in Mélanges Ethnologiques. Dakar, SN: Bulletin del’Institut Francais del’Afrique Noir.